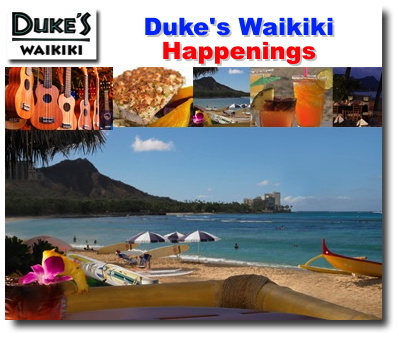 Named "Best Place to Take Visitors" by Honolulu Magazine, "Best Place to Go on a Sunday" by Honolulu Weekly readers and "Best Nightlife Venue" in Hawaii by Zagat Survey, Duke's Waikiki pays tribute to famed waterman Duke Kahanamoku and provides an authentic and enjoyable Hawaiian-style dining experience. 9:30pm-Midnight – Scott Magz & Brady K.
Hawaii's most famous citizen and the "Father of INTERNATIONAL Surfing,"
Duke Paoa Kahanamoku was born August 24, 1890 in Honolulu, Hawaii, the first of six sons and three daughters of Duke and Julia Kahanamoku. He grew up in carefree Waikiki with the ocean as his playground, doing what he loved -- mostly swimming, surfing, canoeing and bodysurfing. Consider our dramatic oceanfront restaurant for your next special event. Whether you are planning a wedding rehearsal dinner, an anniversary celebration, a corporate celebration, or just feel like dining out with a large group of friends, Duke's has the venue for you - with amazing views. Our culinary team can create a memorable menu for your special day that not only reflects your tastes but also your budget. We offer an extensive selection of plated or buffet menu options showcasing fresh seafood, premium steaks and regional specialties. 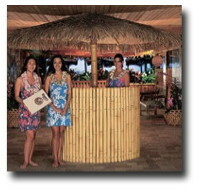 Each and every event is offered with Aloha - the genuine friendly service that is a signature of Duke's and the family of T S Restaurants.